It’s my birthday! Will you also come? I knew I wanted to study for Master’s degree right after I graduated from my bachelor. Oh, no, even before. I have applied for some schools and scholarships since few years ago but unfortunately it was just last year that I was admitted for both the school and scholarship (previously it was just the school). And here I am now, studying at University of Groningen (RUG), Netherlands, the school that I am proud of. I said ‘fortunately’ because it is just the right time. 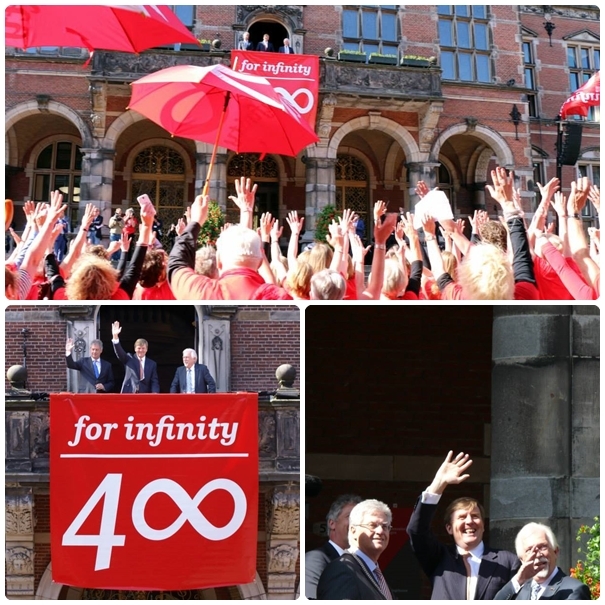 This year is a big year for RUG is celebrating its 400th anniversary: 400 for infinity. University of Groningen, known as Rijksuniversiteit Groningen in Dutch, was founded in 1614. According to information on RUG’s website, this is the oldest university in Netherlands after the University of Leiden. In its 400 years of existence, RUG have been a place of study and work of many talented people in a variety of disciplines, including a Nobel Prize winner, the first female University student in the Netherlands and the first female lecturer, the first Dutch astronaut and the first president of the European Bank. I guess I won’t write much about the history. 400 years mean so many stories, right? So, for now I’ll end it here. I am amazed by how the celebration is organized. Surely it has various activities from fun to academic ones. They vary from music concert, cycling, exhibition, general lecture to research. 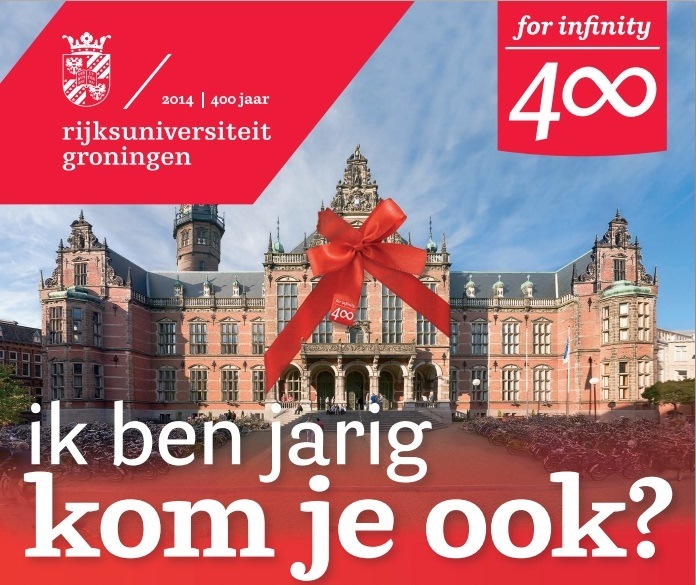 Yes, the celebration of the 400th anniversary is accompanied by an academic study to which everyone can contribute: a Gift for Infinity – a gift for the future. From three research proposal, the theme ‘Let Old Be Gold’ was chosen (with 50% of nearly 8000 votes). As the the RUG campus are spread around the city, the atmosphere of celebration is just everywhere. Last weekend, I made time to visit Groninger Museum again because there was an exhibition titled ‘De student in Groningen 1614-2014’. The exhibition displays unique friendship books (alba amicorum) in which students wrote poetry, assignments and occasionally made drawings, and other surviving objects from these four centuries of education such as medals, costumes and painting of RUG masquerades. One of the well known figures of RUG is Aletta Henriëtte Jacobs (1854 – 1929). Currently there is a building in Zernike Complex which is named after her (Aletta Jacobshal is an exam hall). Aletta was the first woman to complete a university course in the Netherlands and the first female physician. One day someone told me that she had to pretend as a guy to be able to be admitted at university at that time. I tried to find information about that through google but did not find any. However, I found on Wikipedia that, ” In her time at university she became increasingly concerned with social injustice and decided to travel to England to see how women’s attempts to study medicine were being sabotaged.” Oh so, such discrimination of women also existed in so-called developed country. Well.. Zernike Complex, where my faculty is located, is also named after a famous RUG alumni Frits Zernike (1888 – 1966). He received the Nobel Prize for his phase contrast microscope. In addition, he also received countless other awards, honorary memberships and doctorates, both nationally and internationally, for his work in the field of physics. This huge and fancy celebration of ‘RUG for infinity’ is not for nothing. It is an appreciation of 400 years achievement. As for me, it also a reminder to myself that I have to do my best and be one of the students that my university will be proud of.